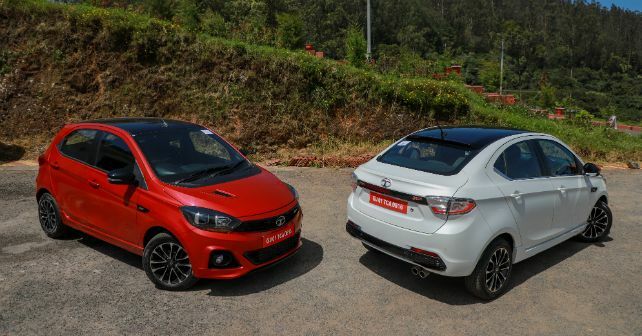 More than a year and a half since Tata announced their joint venture with Jayem Automotives, the first two products have been launched - the Tiago JTP and the Tigor JTP. We drove them both and returned pleasantly surprised. For enthusiasts looking for affordable performance, there aren’t many options to choose from. There is the Volkswagen GT range or the Maruti Suzuki Baleno RS if you want to buy new. Or to a certain extent, even the Fiat Linea T-Jet if you are bold enough - and that too is showing its age. All of these cars are around Rs 10 lakhs or more and so far there hasn’t been much to choose from below the price range. There’s a decent-sized gap in the market there and Tata wants to fill it with performance-focused versions of the Tiago and the Tigor. Make performance available to a larger audience - the intention is right, but are the cars too? Buyers wanting a performance offering - even ones with an affordable prefix - expect the exterior to be in line with the sporty nature of the motor. While most other manufacturers take the easy way out and slap a badge on, Tata has put in serious work in making the Tiago and Tigor JTP stand out. At the front, there’s a redesigned bumper with larger air dams, a JTP-badged honeycomb grille washed in gloss black and projector headlamps with a chrome surround. Along the sides, both cars get a new set of alloys and side skirts. Although the wheelbase remains unchanged from the standard model - for both the variants - ride height has been reduced to give it a sporty stance. The best detail of the car though is at the back - the twin-barrel exhaust - easily gives the car a more purposeful look. While it doesn’t have a loud note, it sounds sweet nonetheless. Inside the cabin, the design remains more or less unchanged. The dash is identical and so is the centre console. There is a noticeable difference, however, in the touch and feel of things. There are red contrast bits all around - surrounding the air-con vents and on the floor mats too. The leather-wrapped steering feels premium and has red stitched highlights. The seats have been borrowed from the standard models but have JTP badging on the seat back and some honeycomb texture in red. The Tiago and Tigor JTP come with a 1.2-litre three-cylinder motor - the same one that also works in the standard cars. But to extract better performance, they have been fitted with a turbo, a different intake and exhaust, revised mapping and valve timings. The 5-speed transmission has been tuned differently too. With all the changes made, these JTPs develop 112.6bhp and 150Nm. Just to put things into perspective - the standard models of both these cars put out 84bhp and 114Nm - both of which come in the upper echelons on the tacho. JTSV (JT Special Vehicles) claims that the Tiago and the Tigor can touch the 100km/h mark from Zero in 9.95 and 10.38 seconds respectively. Right from the word go, there are no doubts about the car’s performance aspiration. The motor feels peppy and acceleration is linear. There is a bit of turbo lag, but once you get past that, the performance is pleasantly surprising. The torque kicks in as low as 2,000rpm and stays at its peak right up till 4,000rpm - this makes it superbly tractable. While the Tigor feels quick, the Tiago definitely feels faster. Of course, the hatchback also has a 35 kilo weight advantage. The engine doesn’t feel harsh but there is that typical three-cylinder thrum. We also felt a slight jerk in the second and third gears - could be a result of faulty fuelling. While the wheelbase and dimensions of the JTPs are identical to their standard counterparts - JTSV has made mild tweaks to the suspension and steering geometry. Both cars now sit lower by 4mm - despite the larger 15-inch wheels. To ensure that the cars deliver an enjoyable drive experience the springs have been made firmer - but we would have liked it to be a tad bit stiffer. On the narrow twisty roads from Coimbatore towards Ooty, the Tiago felt relatively nimbler and more confident. The Apollo Alnac tyres that these cars come fitted have been built for the purpose and it shows. There’s barely any road noise and even when you push the car hard around corners, the rubber doesn’t squeal. Despite the changes to the suspension, the current setup offers great ride quality. It cushions the unevenness of the road with great poise. The only aspect which we thought could have made the overall handling better is the weight of the steering wheel. While the car turns in precisely, it feels way too light for our liking. Tata Motors and Jayem Automobiles together have done a great job with the Tiago And Tigor JTP. All the changes have been made keeping an enthusiast in mind and it shows. In fact, Tata has even got the dealership and service angle covered. The JTPs will be on sale in 11 cities across the country to start with. While there will not be dedicated service outlets for the JTP offerings, the staff will be trained specifically for the task. Coming back to the cars, the Tiago JTP has been priced at Rs 6.39 lakh while the Tigor JTP carries a sticker price of Rs 7.49 lakh (ex-showroom Delhi). At this price point, both these cars are the most affordable enthusiasts' offerings on sale today. They have a peppy motor, packs a lot of punch and handles reasonably well. Tata's step into the affordable performance segment has taken a while, but they have put a lot of time and effort in building both these cars and it shows.